The influx of refugees to Europe is a fact, but how do governments ease the financial burden on themselves and make these refugees economically independent? This pressing, contemporary issue is explored by Wittenborg graduate, Eshban Jan in his final thesis submitted before graduating earlier this summer. 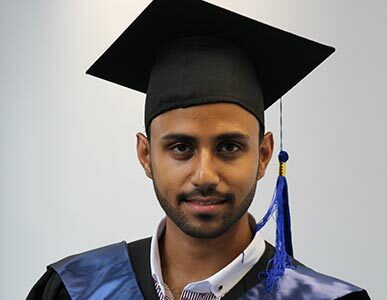 Eshban, from Pakistan, has been awarded an IBA (Bachelor) degree in Marketing and Communication. In the first 10 months of 2016 the majority of the 46 000 people who applied for refugee status in the Netherlands were from war-torn Syria, followed by Eritrea where military service is compulsory. Smaller groups come from Pakistan, Iraq and Afghanistan where people are being persecuted based on religion and/or race. According to Eshban, despite the fact that refugees is a critical issue for many governments, literature on the empowerment of refugees is scarce. His study takes a critical look at the work of the Dutch refugee empowerment organization CAO (Centraal Orgaan Opvang Azielzoekers). Dutch policies on refugees are seen as one of the toughest in Europe.